Are you confused about Opportunity Zone Funds? Join us for an interactive webinar on Tuesday, May 21st as we answer your questions and discuss the latest regulations and developments, real estate tax, fund structuring considerations to get deals funded and closed in today’s marketplace. To register for our new webinar, please click below. As part of the Tax Cuts and Jobs Act (TCJA), the Opportunity Zone Program was established to allow state governors to designate certain areas as “Opportunity Zones.” These zones are designed to support new investments in environmental justice, sustainability, climate change, affordable housing, and more Currently, there are 879 designated Opportunity Zones1 in California alone. Participants can potentially pay little to no tax on capital gains from the sale of the property as long as they meet certain qualifications. The Qualified Opportunity Zone Fund is any investment vehicle which is organized by a corporation or a partnership for investing in qualified opportunity zone property that holds at least 90% of its assets in qualified opportunity zone property. It is not too early to find out if opportunity zones could benefit your business. 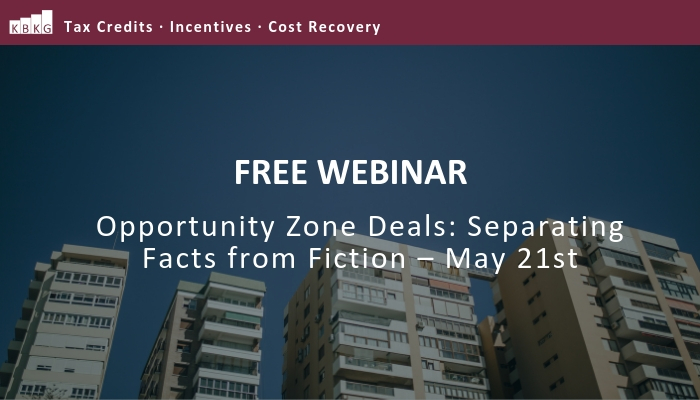 Join our conversation as we separate facts from fiction with industry thought leaders who specialize in Opportunity Zone deals. Register here to learn more about this hot topic: kbkg.com/webinars/opportunity-zone. Ryan Bailine’s practice focuses on the development and financing of complex real estate projects, including real estate, land use, and regulatory aspects. Noted for his responsiveness to his clients’ needs, attention to detail, and his project development acumen, Ryan represents some of the most active and prolific developers in North America, advising on residential, commercial, industrial and mixed-use projects. Sanford C. Presant, Chair of the firm’s Real Estate Fund Practice, focuses his practice on providing fund and joint venture best practice business and tax structuring advice to sponsors of the leading real estate private equity funds, REITs, and their local partners and investors in the U.S. and internationally. Sandy has more than 30 years of experience as a tax and business lawyer for real estate companies. James O. Lang focuses his tax and corporate project finance practice on tax incentive programs, Qualified Opportunity Zone and Qualified Opportunity Fund financing, tax credits, and related state and federal losing over $4 billion of Qualified Opportunity Funds and ancillary Qualified Opportunity Zone deployment of funds.